I've heard Lemon Sole being hailed as the king of the flatfish, something I tend to agree with. 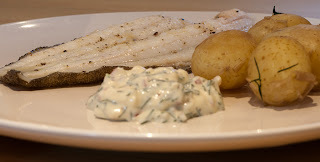 The Lemon Sole has so much natural flavour that I normally just season it with a bit of salt and pepper. The sauce I made with this is one of my earliest recipes and it is really versatile. You can add and subtract ingredients as you see fit. In this variation it works really well with most sorts of fishes but you can easily freestyle it to go with burgers, sausages or whatever you really like to. I was quite frugal this time, I used the dill stalks that I'd normally just discard in the water when I boiled the potatoes. I know that it is very common to boil your new potatoes with mint here in the UK but I'm brought up with dill in the water instead. Mix all the ingredients for the seafood sauce together and season to taste. Put to the side to allow the flavours to mix. Heat the olive oil in a frying pan on a medium heat. Lightly season the Lemon Sole fillets. Fry skin side down for 2 - 3 minutes. Flip, fry for another minute or so. Serve with boiled new potatoes.